This week, in honor of (U.S.) Thanksgiving at T.A.A. HQ, your lit. 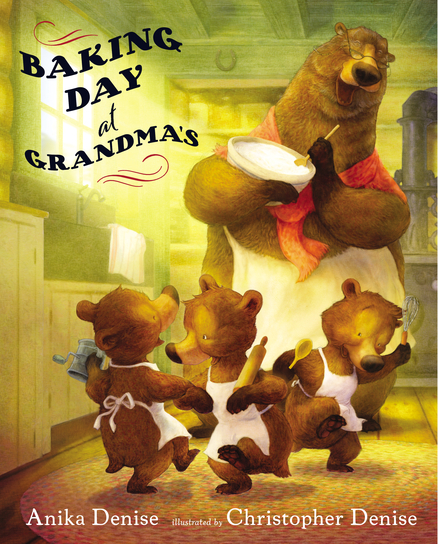 rat reviews a quartet of tomes celebrating family, friends, and of course, FOOD! REVIEW of this book in progress, check back soon! The title may be a tounge twister, but there’s no cofusion about how awesome this book is! I’m new to Pamela Duncan Edwards work, and this was a fun book to get me introduced to her work. Illustrator Henry Cole (Best known for the sadly controversial “And Tango Makes Three”) gives us colorful and spry illustrations and gives special attention the furry pelts of our foxy brood. While Mom’s taking a Florida holiday, her quintet are left to fend for themselves, and while four of the siblings are keen to put their hunting skills to the test, their brother Fosdyke does his “Julia Child” thing in the kitchen. On that note, I’d like to give a short history lesson, and no, it won’t be boring! 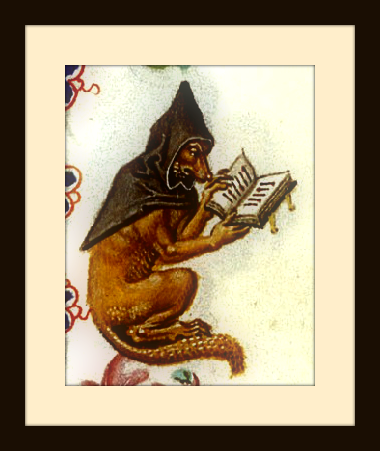 If you’ve read our last two “Weekly Readings” you know that like weasels, as well as rats such as myself and Gabriel (from my upcoming debut novel), foxes are often typecast as the villains and tricksters in fiction. While Fosdyke’s sibs are all too happy (at first…) to be the barnyard stalkers, Fosdyke himself has no qualms with cooking with whatever’s easily on paw, and seriously, mushrooms are a BLESSING for those of us who’re omnivores who want to keep their meat consumption in check. When “The Literary Rat” that my friends, Swinebert and Dempsey have been working with these past couple years, told me about reviewing “Four Famished Foxes and Fosdyke” I couldn’t wait to read it! But being short on cash, I was elated that Bookmobile Sentinel (the traveling library on wheels I work at as librarian) had a copy and I read it during lunch hour. When I was growing up, you’d be hard pressed to find non-evil foxes in books, even wolves have their share of heroes on the side of good, if weren’t not the petty crooks or full on villains, we’re super-sexualized to the umpteenth degree, and that’s particularly interesting in my case being gay. 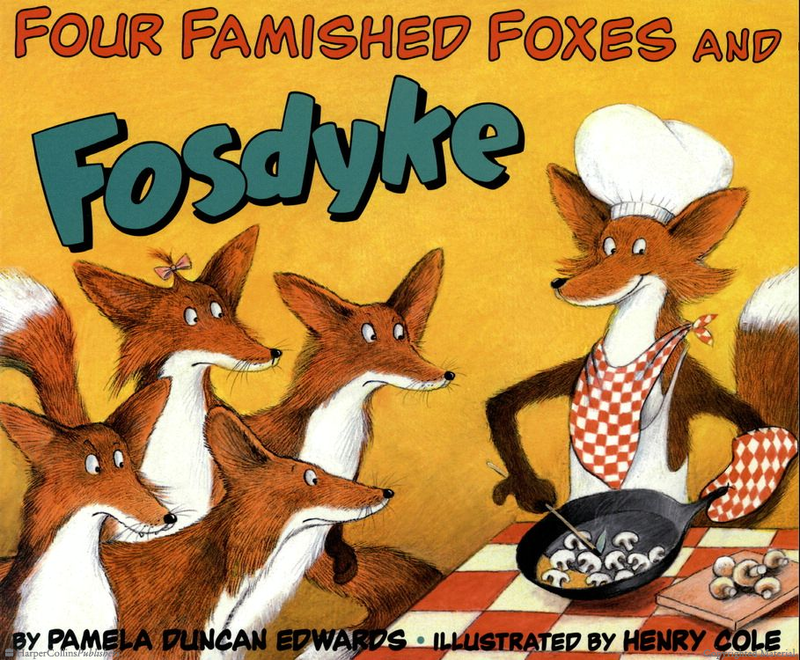 From the title on, “Four Famished Foxes and Fosdyke” is a fun story combing alteration, unorthodox rhyme, stellar illustrations and wordplay using repetition to clever effect. Whoever said it’s easier to make a dishonest living never met Shifty and Sam, two dogs with major hard luck in the thievery racket. For every “Artful Dodger” or “Bonnie and Clyde” there’s a “Laurel and Hardy” of the robber fraternity, and that’s the badge of dishonor these dogs wear. Their “Swag” bag often empty of loot, and as such short on money. The only thing is: they can’t afford to get a ready-made spread, and they’ve never baked before! But hey, desperate times call for learning the precise measurements behind baking, and as a fledgling home baker myself, that’s no idle matter. Luckily with a cookery book on their paws, and the gumption only desperation can bring about, they surprise themselves (and their guests) with a feast of truly delectable edibles. 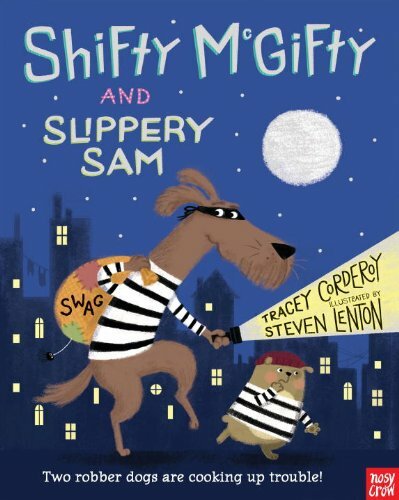 Author Tracey Corderoy uses a light rhyming scheme and couplet paragraphs that convey a concise yet complete narrative that nicely blends with Steven Lenton’s illustrations that use color, light and shadows to excellent effect, I truly felt like I was living out a short film as I read through. It took forever to get to this one, which is becoming an unintended theme of my reviews as of late, but as I suspected it was worth the wait. The story begins at a fancy party. I don’t know about you, but I’ve been to my share of gatherings that left a lot to be desired, but while I was more apt to be the wallflower rattling on the outskirts of large gatherings, Little Ellie is far from shy, but not only is she not having fun, she’s STARVING! But everyone’s too busy saying Ellie’s “Too Small” to be here to notice. Before she gives into despair, Ellie notices a hole in the wall, and being the curious gal she is, peaks inside- She discovers the miniature set of the (appropriately named) “Hole in the Wall Kitchen”cooking show, hosted by a mouse chef, and that alone was enough to get me, and while I’ve not yet seen Pixar’s “Ratatouille” (I’m getting to it, okay?) anything involving food or cooking will always spark my interest. Illustrator Edward Hemingway’s retro-inspired art style is like this love child between colorized “New Yorker” cartoons with the exaggerated facial features of “MAD” (though a lot more tasteful, in my opinion, no pun intended) creating something that feels old and contemporary at the same time. Not an easy feat to achieve. Plus, the excellent use of rhyming by our minature culinary friend adds a fun dimension to the story. 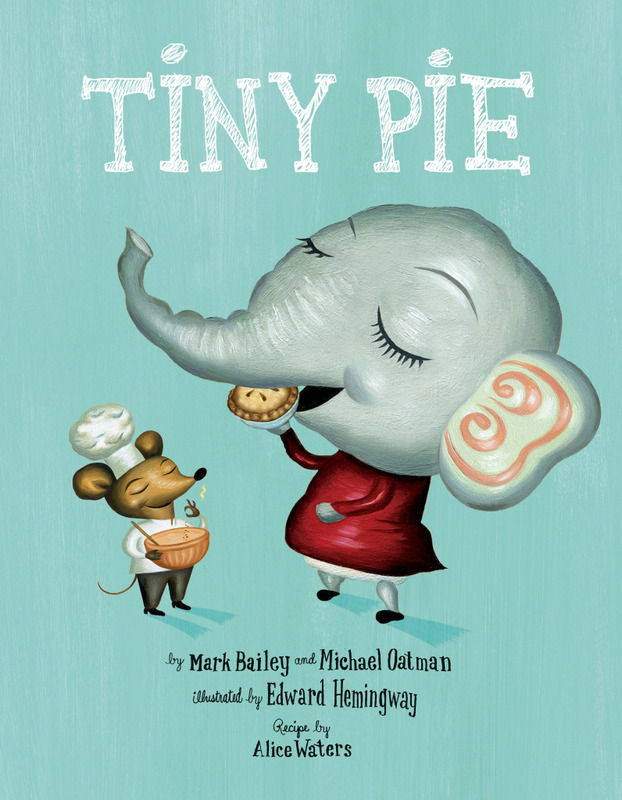 “Tiny Pie” is a charming reminder that no matter how small we feel, whether in the figurative or literal sense, nothing worthwhile is out of reach, and sometimes it takes a little gal’s (or guy’s) touch to do BIG things! Side Note From The Literary Rat: I haven’t gotten the chance to try the recipe at the end of the book yet, but I will, and share my thoughts during our holiday showcase. That’s it for Weekly Readings! See you next time.